Getting a taste for Essex Pelee Island Coast wineries. With the cooler weather upon us, what better time to reflect on some of the great summer winery events in Ontario’s Southwest. Like the fabulous time we spent with over 500 of our closest friends at Vintage Tasting in Harrow hosted by members of the Essex-Pelee Island-Coast wineries (EPIC). Ok, so maybe all 500 weren’t our closest friends when we got there but by the end of the day they were. We’ve been to fancy wine-tastings in Toronto hotels that can only hope to be as good as the EPIC event someday. In a modest fashion typical of Ontario’s Southwest, it was simply called “A Country Picnic and Pairing”. It was the best picnic I’ve ever been to! Not only did we sample fabulous wines from the likes of Cooper’s Hawk, Oxley, Viewpointe, North 42, CREW, Muscedere, Mastronardi and the like, but we were also amazed by the fabulous food! Hats off to Ann Neydon Wilson and her fabulous team at Oxley Estate Winery for organizing and hosting this spectacular event! We caught up with Ann as we were heading out and she said “Heaven smiled on us today. We had perfect weather, world-class wines, delicious, freshly prepared, local food and over 500 happy visitors having a great time. It was perfect!” Jody Goslin, Master Taster at Oxley, deserves great praise and thanks too, as does Tom O’Brien, President of EPIC and owner of Cooper’s Hawk Vineyards. We’re already wondering when tickets go on sale for next year’s event and which winery will host it. 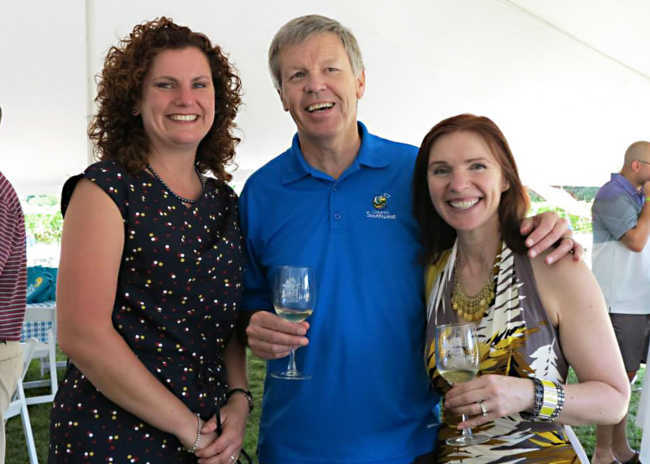 Thankfully, we didn’t have to wait a full year to enjoy more of EPIC wine country as the Shores of Erie International Wine Festival was just a short drive, and a few weeks, away in the scenic town of Amherstburg. For fans of great Ontario wine & culinary, like us, this festival has become an annual tradition. Once again, the Shores of Erie festival took place at the historic Fort Malden. The locale makes for great festival atmosphere with the wide open green spaces and waterfront views. As we arrived just after lunch time, we made a b-line for the eateries right away. We managed to try a bite at nearly each food vendor but the braised beef short rib sliders from City Grill were our favourite with the authentic Italian pizza from Oropomodoro coming in at a close second. With the hunger fully satisfied, it was time to focus on all the great wine from EPIC wine country. With Colio, Erie Shore, Aleksander, Sprucewood, D’Angelo, Paglione, and Pelee Island wineries, along with other EPIC wineries from the earlier Vintage Tasting event all pouring samples, we were all spoiled for choice. No matter what type of wine you like, it was all here to enjoy; there were even wine slushies. With so many of the region’s great wineries in one place, you can definitely taste the world-class quality and the talent of the wine makers with each sip. To top it off, the event also featured live music on stage all day to enjoy. The weather was surprisingly warm on the Saturday afternoon and there were a couple of bouts of rain but that didn’t seem to dampen any spirits; the people continued to pour into the festival grounds. By the time evening rolled around, almost every vendor had a line-up and every picnic table was full; the event was a true sellout. This was our second visit to the Shores of Erie Wine Festival and I can honestly say we enjoyed it even more this year than last. It is easy to see why it is one of the premier wine events in Ontario’s Southwest and a great showcase of the growing wine region of Essex Pelee Island Coast.